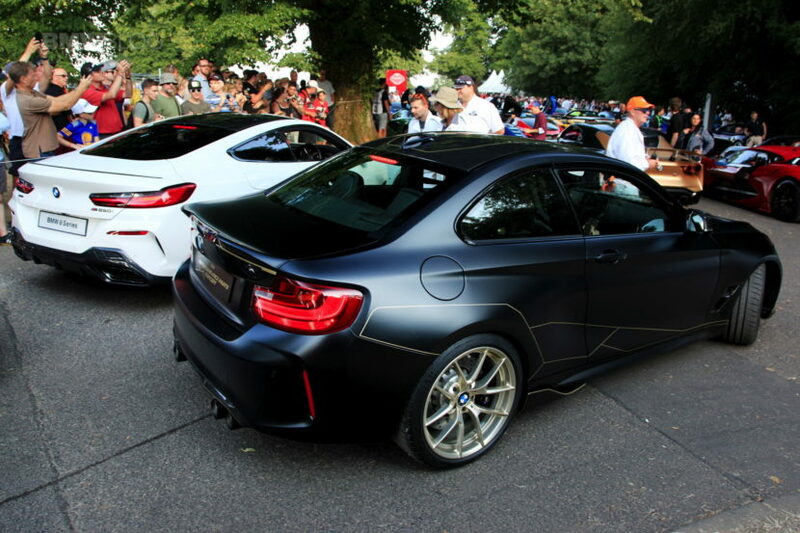 One of the stars of the BMW exhibit in Goodwood was undoubtedly the all-new BMW M2 M Performance Parts Concept. The unveil was quite a surprise by BMW and judging by the amount of chatter online, it was positively received by the car community. The M2 Concept with M Performance Parts feature a Frozen Black finish with gold M Performance decals that give the car a motorsport-inspired look. It also gets a carbon fiber hood with a power dome, a carbon fiber roof finished in a glossy clear finish, a completely new trunk lid with an integrated carbon fiber spoiler and new gold wheels. The M Performance suspension lowers the car by 20 millimeters and gives it better road-holding ability. Both the suspension and brakes have been finished in black to match the rest of the car. An additional weight reduction of 14 kilograms is achieved by the use of a lighter BMW battery. The complete wheel set with 19-inch M Performance forged wheel Y-spoke 763M in Frozen Gold (expected to be available from 7/2018) with semi-slicks not only provides a visual highlight, it is also six kilograms lighter than the standard wheels. The M Performance carbon fiber tailgate weighs five kilograms less than the standard part. 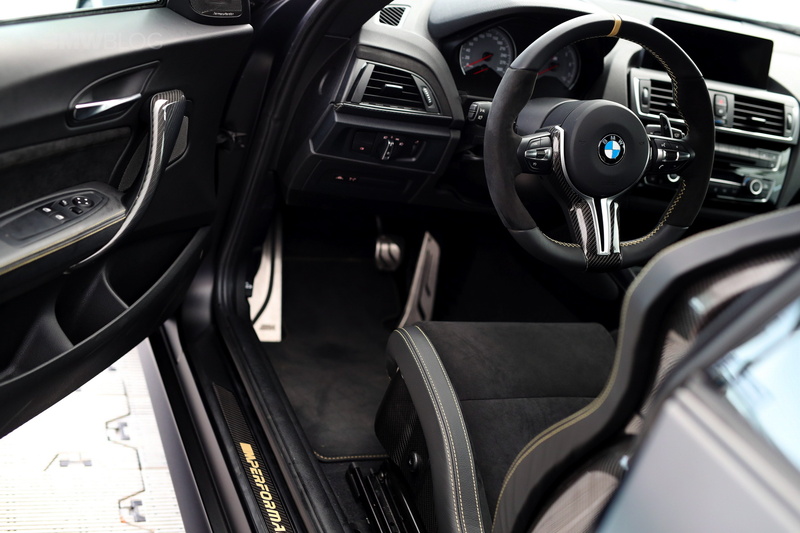 The cabin is dressed up in Alcantara, starting with the sport seats with gold contrast accents and the M Performance steering wheel with gold stitching. More gold stitching can be found on the door panels. 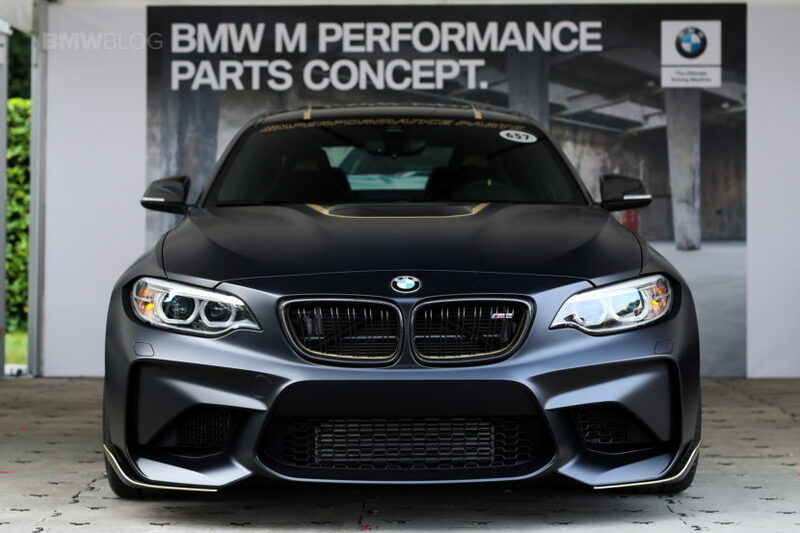 The M Performance trim finishers also combine the two refined materials – carbon fiber and Alcantara. 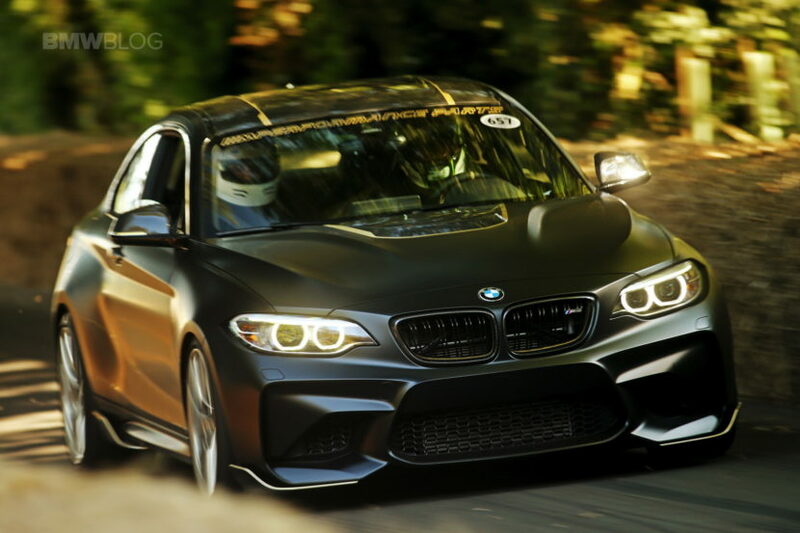 And since the Goodwood Festival of Speed is all about…speed, the M2 Concept with M Performance Parts went on the track to wow its spectators with the new, improved look and of course, its driving dynamics.